This is primarily an February 2012 Automotive Report toon I did with the ever talented Allen Forkum. I added the coloration and quote box for today's post. Every once in a while, the Buster Mcnutt column that appears each month in Allen's paper will explore a topic that isn't necessarily about the automotive industry. Now that's a hard case of writer's block. Not exactly your most subtle work John, but it gets the job done. Maybe if Buster can't think of anything to write, maybe you can draw (pun intended) a parallel between art and automotive repair. 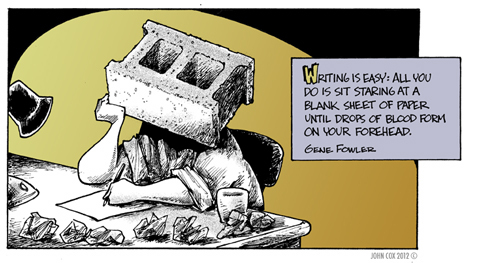 I'd rather have Writer's Block than Writer's Shlock. A little fear and loathing does wonders for good art and writing: it's called MOTIVATION. I rarely have trouble with the "blank sheet" problem. I can always force something stupid, insipid, convoluted, obtuse and poorly written. I'm sure the readers here agree. But to craft work that is concise, intelligent, well-written and valuable can be impossible until my mind is ready. Heard that. I have a damned healthy respect for thought-provoking writing that inspires excellence. Fun to enjoy, hard to do. ................roughly the same place Mitt pulled his South Carolina concession speech - he just dug a little deeper. Yeah, but the SOTU was clearly intended to defraud the audience for the election with the main stream media's assistance - it is clear that after three years in office, Obama has no intention of doing any of it. Just words, meaningless words, because his actions have belied them. I've looked at the drawing several times since posted and something just bothered me about it. I think I figured it out. If that were me, that coffee mug would have been on the floor long before that many failed attempts were made. It also suddenly dawned on me that the writer is left handed. "It also suddenly dawned on me that the writer is left handed." Well there's the problem! Everyone knows, that's RIGHT HANDED paper! There is nothing worse than having something to say and no way to say it. I just recently read The Great Mouthpiece, by Gene Fowler. It was a fascinating book, and most of the book had something funny on every page. Another wonderful book by Gene Fowler is Beau James, which is about New York City Mayor Jimmy Walker (1925-1933). This page contains a single entry from the blog posted on January 24, 2012 7:49 PM.